METHODS: Totally 109 patients who routinely received in vitro fertilization/intracytoplasmic sperm injection (IVF/ICSI) at Reproductive Center were assigned to the control group (56 cases) and the EA group (53 cases) according to even and odd-numbered date. Patients in the control group received controlled ovarian hyperstimulation (COH) referring to GnRH-a long protocol. On the basis of COH, those in the EA group received EA from the day of Gn injection to the day of embryo transfer. Estradiol (E2), vascular endothelial growth factor (VEGF), interleukin-6 (IL-6), and angiotensin (AT) II were measured in all patients on the day of hCG injection, the day of ovum pick up (OPU), and the day of embryo transfer (ET), respectively. 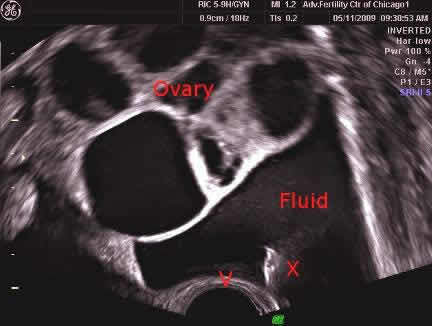 The oocyte retrieval rate, good quality embryo rate, clinical pregnancy rate, the abortion rate, and the occurrence of OHSS were compared between the two groups. RESULTS: Compared with the control group, serum E2 levels on the day of OPU and the day of ET were significantly lower in the EA group (P < 0.05). On the day of OPU levels of VEGF and IL-6 also significantly decreased (P < 0.05). Serum levels of VEGF and IL-6 reached the highest line on the day of hCG in the two groups, and then showed a decreasing trend. Compared with the control group at the same time point, serum levels of VEGF and IL-6 obviously decreased on on the day of OPU, hCG, and ET (P < 0.05). The occurrence of OHSS and the canceling rate of transplant cycle were significantly lower in the EA group than in the control group (P < 0.05). CONCLUSIONS: EA, as an adjunctive therapy, could reduce the occurrence of OHSS in IVF. Besides, it did not decrease good embryo rates and pregnancy rates in IVF-ET, which might be associated with lowering local vascular permeability of ovaries.